You're taking too long to scout | DBP MAGAZINE ONLINE The World's Best Free Whitewater Publication. Ross Montandon is the creator of New Wave Kayaking, an awesome coaching and guiding company based in the UK running trips to UK classics and further afield. Check out their site and facebook for more info. We’ve all been in that scenario, standing on the bank looking and looking. Sometimes our demons need convincing its ok to walk. And sometimes you’ve made a choice, but somehow you are still looking and wondering. In this article we will look at how to speed up the those scouting missions both for you personally and to move the group along. We decide we need to scout because we can’t see if the way ahead isclear from our boats. So we initially want to hop out quickly and check if it’s clear. At this point it’s generally yes or no. It can either be good to go or not at all. Nice and simple. If the the rapid is a walk it’s easy to signal my buddies and start walking. Sometimes it’s easier to walk than to test your ego on the rapid! Shoulder your boat and enjoy what the rest of the river has to offer. The amount of times I’ve been on a river personal paddling and paddlers in the group want to run every single rapid. However environmental factors mean actually its one of those days where we should shoulder our boats and move on. Perhaps it is an unknown, remote river or the river is rising and you are unsure on how quick it will rise. Or perhaps you are in Scotland in the highlands and you’re running out of daylight. Stepping in and going ‘ Alright guys lets just walk it.’ is often the best and direct approach. If you can’t describe the rapid within 3 moves then your guys will need a visual check. This is where the pace on the river really slows up. Everyone gets out and then a massive discussion begins and the clock just drains! People get cold and lose their ability to perform and focus. We’re going to look at two personal aspects of how you can arrive at a decision. Once you have decided, you can support your group to come to a decision. You don’t have to be a leader, just a boating buddy. If I can’t see the line, then I have fallen short. The first thing is to find the line. If the line looks fun and doable then good to go. If I can see a line but I don’t have the technical skill to make it, then it is time to shoulder that boat and crack on. Can I see myself making the line? Sometimes you may hear yourself saying. ‘On a good day, I can make it.’ The question is are you on a good day today? Or a good enough day to run it? Bear in mind we don’t need to be operating at 100% all the time. A lot of the time 80% is better. If we do need to be completely at 100% perhaps we are too close for error? Do I want to step up? Am I feeling it? On this day right now? Do I want to play the game? Sometimes we get worried about one rapid on a river. It drains us down, we think about it as we put on. It sort of looms over us. “What am I going to do at Euthanasia.” Take it day by day, rapid by rapid. Some days I get up and want an adventure on some challenging water. And on others I want a quick lap on my local with my buddies and home for roast beef and Yorkshire pudding. It doesn’t matter what you have done in the past. Imagine a sports star like an Olympic swimmer. Do you think he/she could swim the same Olympic 100meter time they could 10 years on? Probably not. Everyone has peaks and troughs. It doesn’t matter if you did the Stikine 5 years ago. What matters is are you feeling and what’s delivered right now. There is one thing to be able to make the choice yourself. There is also a skill in moving on the group and keeping the day flowing. Here are a few tips for helping your mates make that choice whether they want to run or not. Scouting is all about information gathering, I only scout if I can’t get the information needed to make an accurate decision from the boat. I only get the group out if I have hopped out on the bank and I can’t give the line in 3 key moves. Less confident paddlers will always want a visual. It could also be that they just don’t trust you yet. That’s ok! I only drag paddlers out of their boats if I feel there is something to be gained by looking at it. If you want to dissuade a paddler? This may sound odd but we all have that mate who wants to either run everything because he forgot his lunch and packed a double portion of ego. Or more likely that paddler who doesn’t have enough knowledge to weigh up their ability with the risk provided by the river. It may be best if they portaged or the whole group portaged just for ease. Sometimes you have to think about the big picture. How to encourage an on the fence paddler? 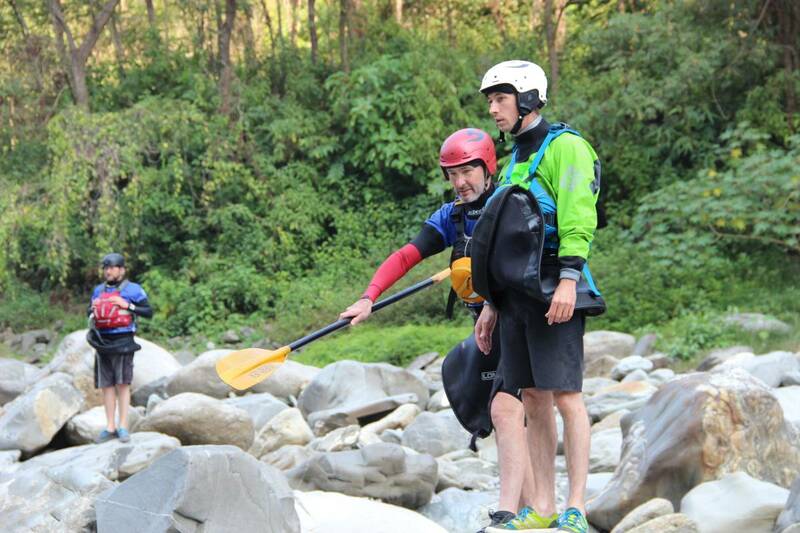 If you have someone who you know can paddle the rapid but is having a bit of a wobble a few key points can help. Generally there is a tipping point on how long you can wait and look at a rapid. After a while a great technique is to go around the group and go “yes or no?” Get the answer and move on. Get the wagon rolling again. As a whole scouting can be made much quicker and more efficient if you trust your team members and can go on their say-so. If Steve says it’s a boof it’s a boof and so on. Having paddlers who you can trust is sometimes much more valuable than having paddlers who are super talented in the boat. I have friends who are incredibly technically skilled but when they give directions I take it with a massive pinch of salt. Perhaps this leads for another blog? 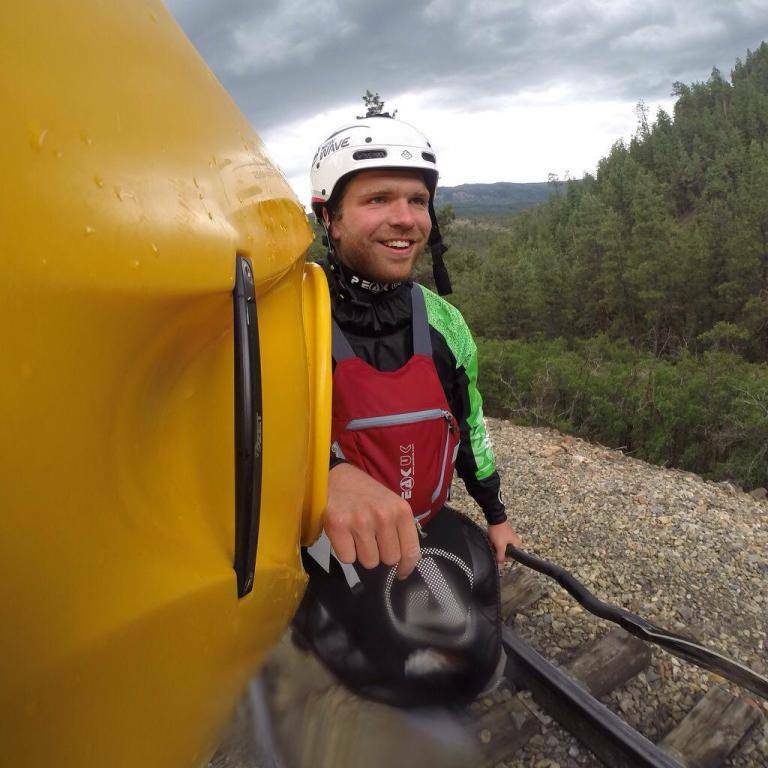 Ross Montandon is creator of New Wave Kayaking. 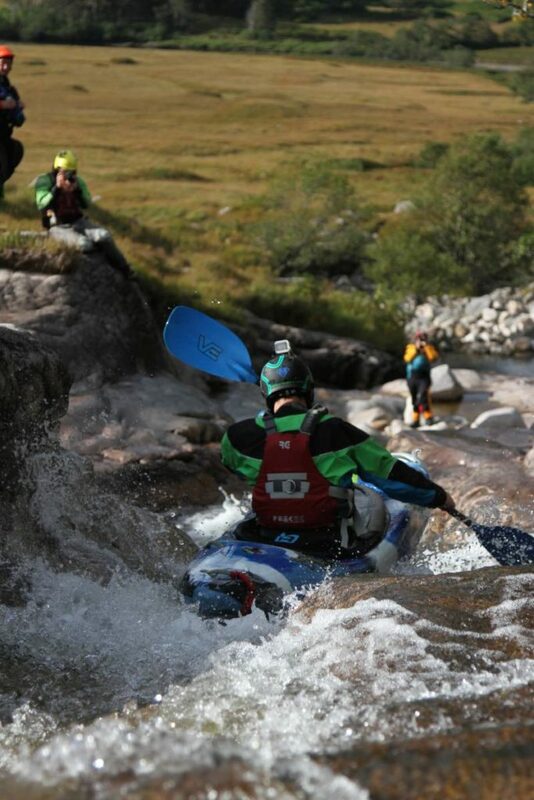 A whitewater Kayaking specialist who offers skills coaching courses all over the UK and Europe. Ross has been British Freestyle Champion. Coached the British Freestyle team. Along with paddling all over the World. Ross is also a Level 5 coach. 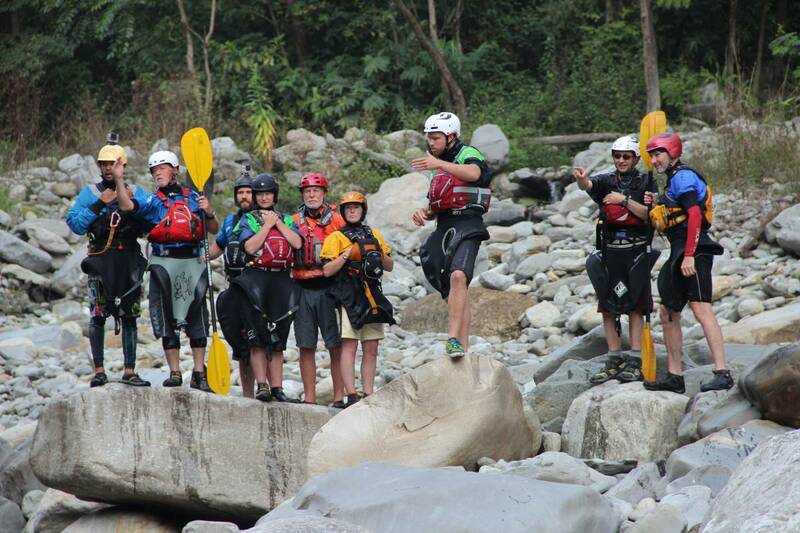 And provides British Canoeing Moderate and Advanced Whitewater Leader courses. 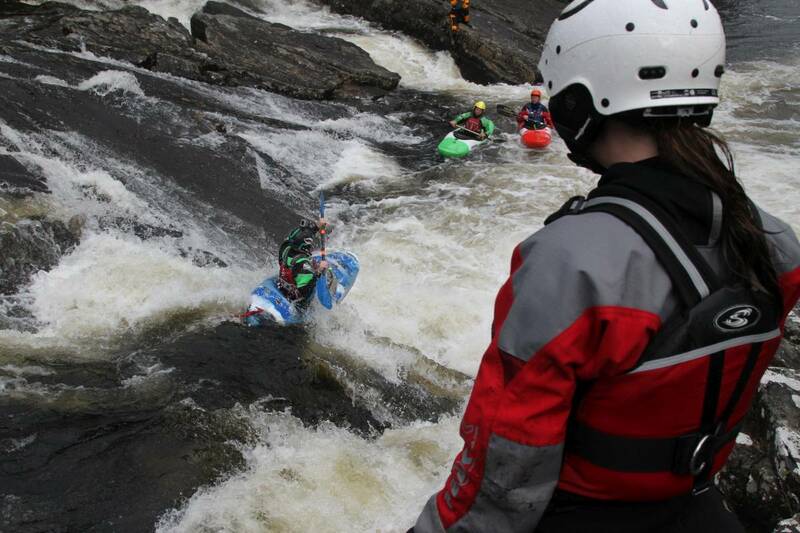 As well as Whitewater Safety courses. When not on the water you will find Ross on his Sup in the Peak District on his bike or cooking up a storm in the kitchen after spending the day doing all of the above.